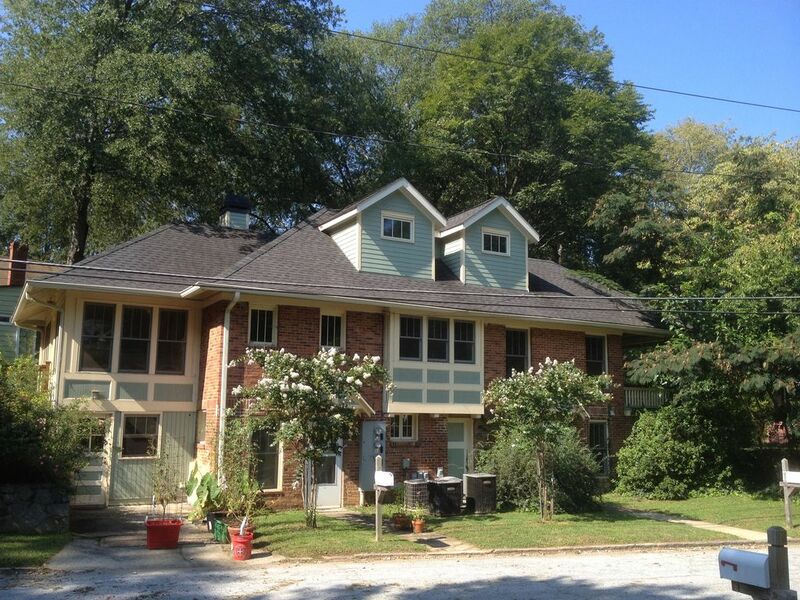 Decatur Downtown Residential Triplex In Walking Neighborhood, 5 min walk MARTA! Decatur Downtown, 1BR free Parking, Walk Around At Night And Come Home Safe !!! There is one bedroom that has a Queen bed. There is a a full-sized futon in the living room AND a twin bed hiding behind the bookcase! Towels and sheets, soap, shampoo, hairdryer, iron/board included. Quiet street, truly in downtown Decatur, 2 minute walk to Emory's free shuttle (the Cliff) , and 5 minute walk to MARTA train and buses. No Carpets, Pets are Ok. We are dog people, too. We have supplied blankets to cover furniture/bedding in case your pet is a couch surfer! Stocked kitchen, plates, pots, utensils, basic condiments, microwave, toaster oven, coffee pot, Fridge, stove, cleaning stuff, laundry room. I want to be transparent about two things. This is house is cozy, and well-appointed. 1. This is a "terrace apartment". You walk in on ground level, as you can see from the pictures. Terraced because the back of the house is built into a hill, so the rear windows are full size, but at shoulder-head level. 2. Size = 600sq feet. Eat-in kitchen, living room, bedroom, bath and closet, that's it. It is still twice the size of the Marriott (3 minute walk!!) room with 2 queens, and less than half the price!! Decatur Native attorney married to Atlanta native attorney, 3 kids, urban gardener with about 750,000 bees (not on this property!) and exactly 26 laying hens (not here either). Youth coach, Rotarian, Mountain Biker, Birder, Geek. An old friend owns this house, she's living in Evanston, IL for the next few years, I'm helping her . I couldn't have imagined what an incredible business experience this has been for a young lady. Letting her convert a few of our apartments into short-term rentals has given her first-hand business experiences that babysitting just doesn't cover!! I live a few blocks away. How civilized is it to walk 2 blocks for great sushi, the Brick Store Pub, Eddie's attic, or Ted's Montana Grill? Late check-ins are never a problem since we'll assign you a door code, and you don't need to meet for your 'key". We really want to maintain our flexible policy on check-in and check-out times. Here is my promise: I will do everything I can to accommodate your times if you can be patient for the guarantee. I've got to check with others to make sure it works... If you MUST check-in at 6am AND you need to know that when you make the reservation, you'd better book the previous night, because someone else might. I can't insist they leave at 5am (but I will ask them!!! cause sometimes they are catching a flight...) Early check-in and late checkout depend on both your requests and the preceding/ following guests', then me negotiating something reasonable. If the night before you is not booked (and we won't know until that afternoon!) we'd normally be happy for you to check-in at 8am... If you want to check out at 5pm and no one is coming that night, no problem!! We'll see as we get closer. But, we do have a space where you can store bags. Otherwise, here is what the HOUSE MANUAL (in your Itinerary) will say-- Check-in will be anytime after 3 pm and Check-out will be anytime before 11am UNLESS YOU REQUEST flexibility with some notice. You are a 5 min walk from the Square!! park right outside your door!! rockin' wifi, there will be a password on the fridge "House Manual"
The front door is a 3.0 (36'' wide), the bedroom door is a 2.4 (30'') and the bathroom door is a 2.2 (26''). Great location, it was an easy walk to downtown Decatur. We were visiting for a wedding in Decatur so this was absolutely perfect. We were able to walk to the wedding and explore the town the rest of the weekend. Easy check in / out with the lockbox. Place had everything we needed. Scott sent instructions ahead of time with everything we needed to prepare. This rental is so cozy and is in the perfect location. It is a safe neighborhood, with many things to do just in walking distance. The MARTA to get to downtown Atlanta is just a few blocks away. We stayed here for the Music Midtown festival and it was just what we were looking for. We enjoyed the quiet, comfortable, and convenient property. Scott was an excellent host. We visited Decatur for a friends birthday party, which was held at a pub in Downtown Decatur. This apartment is in an ideal location to walk to Downtown—the walk from Scott’s place to downtown did not require walking along any questionable streets and the neighborhood felt extremely safe, even at night. As for the apartments amenities, we had no complaints. Check in was simple, the apartment was clean and made up for our arrival. There were towels, clean sheets, and extra blankets. It was quite chilly when we visited and the apartments heater kept us very toasty. Next time we visit Decatur, we will certainly reserve this place! The neighborhood is in a good central part of Decatur. Good instructions were sent in advance. The problem was the passcode provided did not open the unit. My wife and I tried the code over ten times before going off to find a room elsewhere. I did send a response of the problem to the owner the following day but I have not seen a response yet. There are positive points for this rental. It is a good location for easy walking to downtown Decatur and for getting on the Marta for going into downtown Atlanta. Scott did address the too firm mattress. We had bought a memory foam at the local WalMart after our uncomfortable first night. He bought it off us and even bought a second 2" foam to replace the 1 1/2" that we had bought. That solved the bed issue for us. Our holiday was being out during the day and after supper relaxing at our home. The couch was not comfortable for sitting on for any length of time. It was not possible to comfortably put your feet up. The rental is outfitted like a cabin with a random assortment of dishes, cutlery, furniture etc. Laundry is available but it is an attached building that you have to access by going outside. And it is shared with others. We had been on the road for over a week so doing laundry was important for us but the laundry room was not a nice attractive room. Two washers and a dryer did work though so it was "good enough". All in all for us, it was not comfortable enough for the 9 days that we spent there. Pet Fee is $15 per pet, per stay-- PET OWNERS - We are dog and cat people, too. We need your help in order to maintain our open policy to pets. Pets are not allowed on furniture/beds without drop cloths or sheets. We have a few at each listing. $15 per per , per stay fee does NOT apply to carpet/furniture/bedding cleaning! !